We’re into the second of three major home improvement projects here at the TreeHouse. The first was the replacement of the 30-year-old wall-to-wall carpet in the upstairs of our 30-year-old split-level house back in November. I had laid down laminate flooring in one bedroom that was being made over into a quilting studio in 2005, and we had new linoleum put down in the kitchen in 2009, so the carpet everywhere else was the last floor-covering waiting to be replaced on the entire upstairs except for the tile flooring in the two bathrooms. 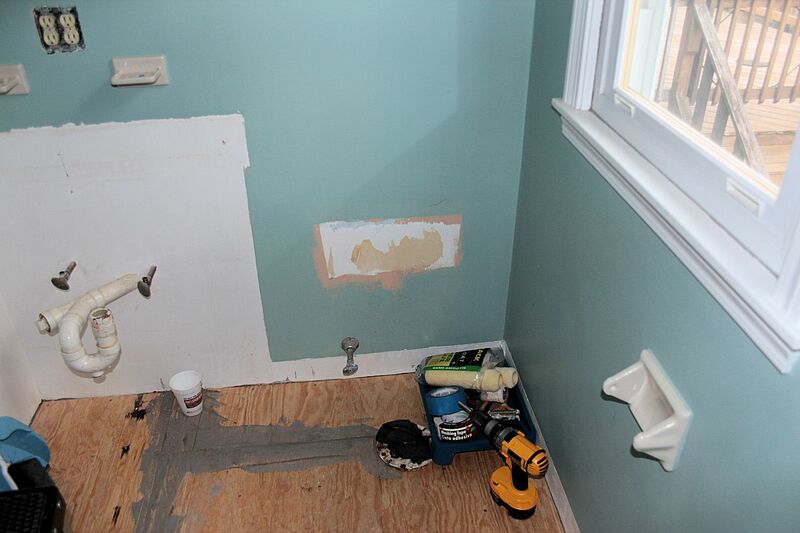 Now we’ve gutted the master bathroom off the master bedroom (everything except the shower stall). 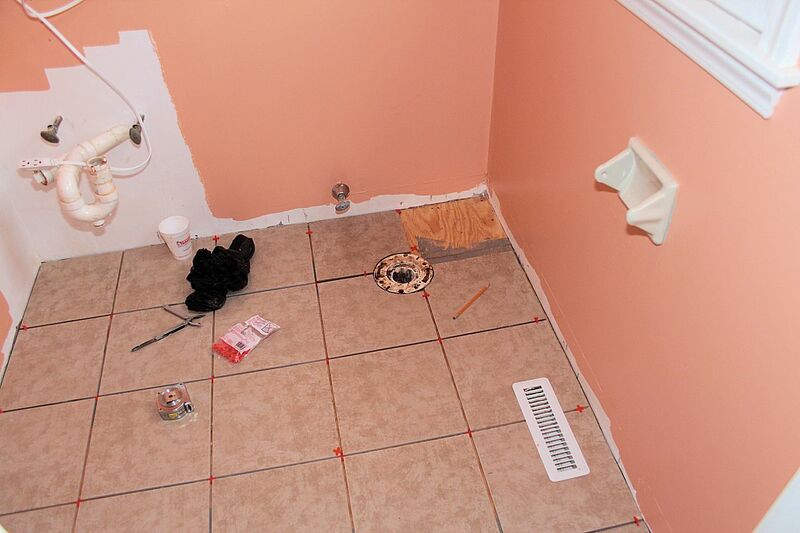 There was an indentation starting to show in the floor under the toilet, so we suspected that there was some water-based rotting occurring in the subflooring under the tile that was under the toilet. We enlisted the aid of a retired relative (one who knows what he’s doing!) to help with the demolition and reconstruction of the bathroom. We pulled out the sink and vanity and the toilet, then pulled up the 1970’s-style itty-bitty tiles on the floor and pulled up and replaced the sub-flooring which had indeed started to rot from water-damage. During the interim between deconstruction and reconstruction we pulled the medicine cabinet and shelving down and painted all the walls in the bathroom, changing the color to something more in tune with the bedroom colors. 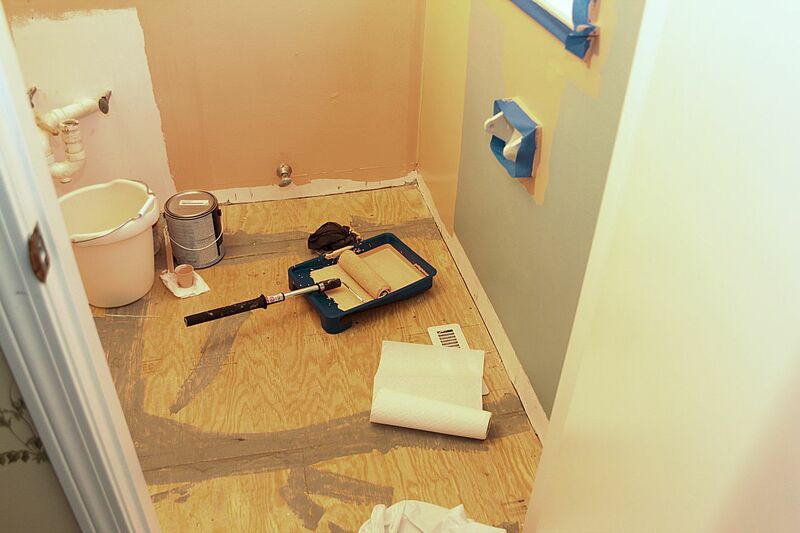 This weekend we’ll start laying new tile flooring (12-inch square tiles rather than the sheets of itty-bitty tiles). I lined up the rental of a tile cutting machine for the weekend to assist in laying the floor, then we’ll set the new toilet (a taller-sitting throne than the one that was replaced – low-sitting ones are not the norm anymore, lucky for us! ), install the new vanity and sink, re-install the medicine cabinet and the shelving, paint the window and door trim and the mop-boards, hang new shades and curtains, and declare victory over THIS home improvement project. Third in the series is to replace the front door to the house, with the side-light pane, which is now leaking heat like a sieve. We’ll attack that after the bathroom is finished but before the heat of the summer commences. The tiling went great. 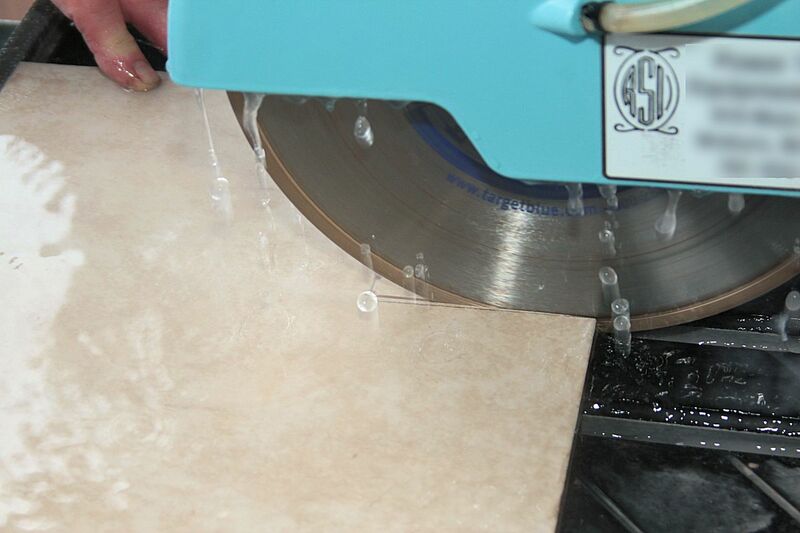 I rented a water-assisted tile cutter from Power Tool and Equipment Rental in North Woburn and my brother-in-law helped me cut and lay the tile… the skill and knowledge was all my brother-in-law’s; I just helped. 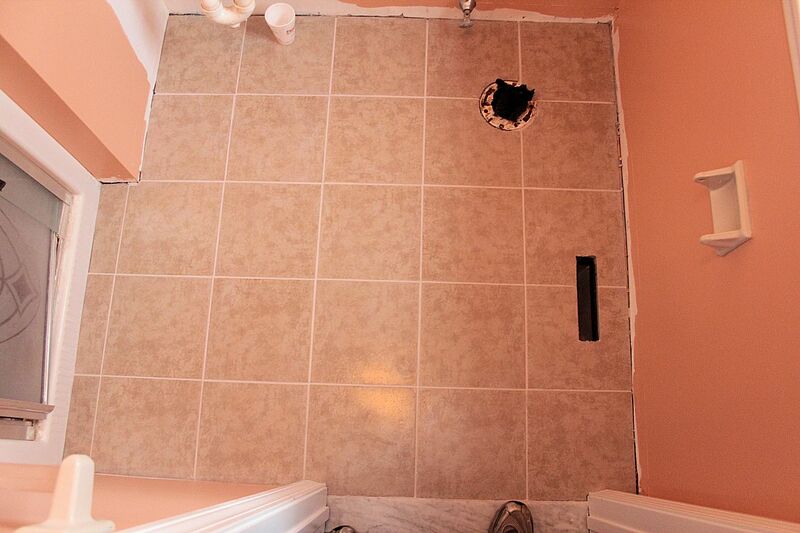 We lucked out in that the depth of the bathroom was EXACTLY five 12-inch-sqare tiles, WITH grout spacing. It couldn’t have worked out better if we had planned it! So all we had to cut were the tiles along the left side of the room, around the toilet drain, around the heat/AC vent, and two notches out of the tiles on either side of the threshold. I picked up the tile cutter at 8 a.m., we started at 9 a.m., we were done cutting the tiles by 12:30 p.m., we were done setting the tiles by 2 p.m., and we returned the tile cutter by 2:30 p.m.! The tile adhesive instructions said to let it set for 24 hours, so Sunday afternoon we grouted the spaces between the tiles, let it sit a bit and wiped everything down with a damp sponge every hour for the rest of the day to get the grout excess up before it permanently bonded with the surface of the tile. The grout needs to cure for a week, then we’ll install the new toilet and vanity/sink. Bit by bit! 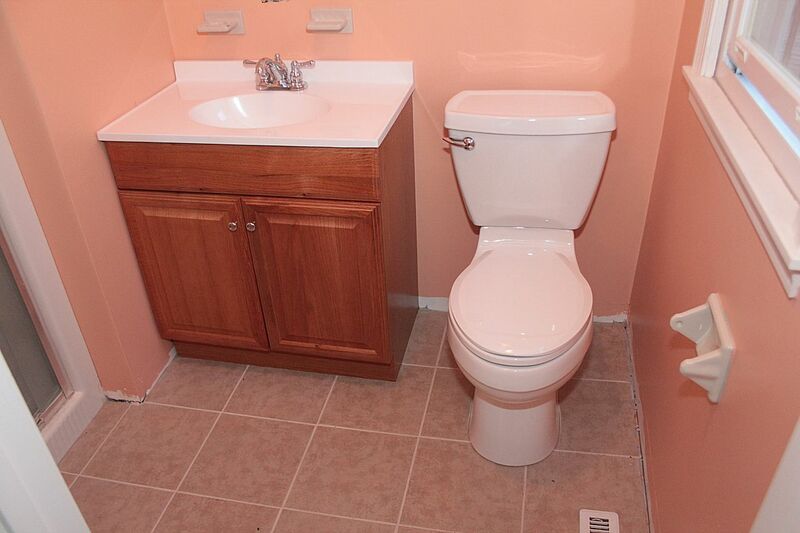 The grout has cured for a full week and a day, so its time to install the toilet and vanity/sink tonight! My brother-in-law showed up before I even left work, and by the time I was ready to leave I got a call that I needed to pick up a 14″ water supply line for the toilet! I scooted (well, one doesn’t “scoot” on the roads around here during rush-hour) over to Lowe’s and got a 16″ one (12″, 16″, or 20″ were my options) and scooted home. By the time I got home the new vanity and sink had also been put in place, waiting to be connected up and installed. The sink water feeds I salvaged from the old sink were too short, and the basin drain was slightly off-center to the trap, so off we went to the hardware store down the street for a pair of 16″ faucet water feeds and a corrugated adjustable offset drain extension. We hooked everything up, tested it all, tightened a few junctions where drips appeared, and declared victory! The curtains got rehung so the bathroom is spartanly usable now. Next up is to rehang the medicine cabinet and reconnect the cabinet lights, rehang the auxiliary shelving, paint and mount new mop-boards, silicone caulk the shower stall-tile junction, and repaint the door and window trim! We’re on the home stretch now!! This entry was posted in General, House, Woburn. Bookmark the permalink.